Thank you very much for this very useful information. 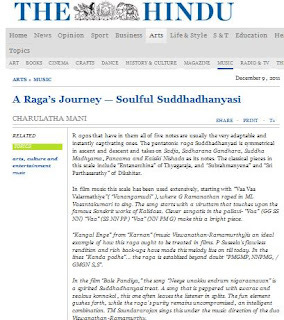 I am very much indebted to you for enabling me enjoy and appreciate these ragas .I will be adding all your Isai payanam DVDs in my collection. You are doing a great service to your rasikas by sharing your well researched knowledge . * You are doing a yeoman service to the CM world by popularising the Ragas with simple example of known kritis in CM &film music. I wish you had listened to TNS srudibedam of Suddha Dhanyasi in Kalyani in his MA concert this season. Kudos to your mission of popularising CM Ragas through simple methods.Great effort sustained.